Description:We don't get these very often and they are very desirable. This is a non-battlefield example from the workhorse of the field army artillery, the 12 pounder smoothbore. 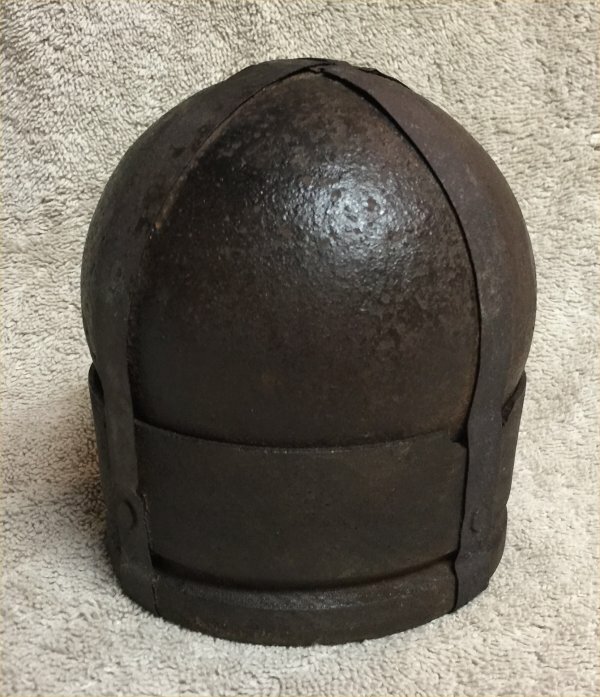 The patina on this is just wonderful with a deep dark brown look to the iron and the wooden cup. The iron is of course very smooth since it is non-dug. The sabot is in super condition. It has only one very small crack about 1 inch long from the edge that is so fine that I doubt you would have noticed it. Otherwise about perfect. The straps are very good with good patina and some light surface rust. Two of them have rusted through but there are no missing pieces. it appears that the rusted straps are glued in place to keep them from being pulled loose. Also a piece on the bottom is loose from rust action but still intact. It has all 4 nails. The straps are curved into the groove as they should be where the twine used to be but like nearly all is long gone. 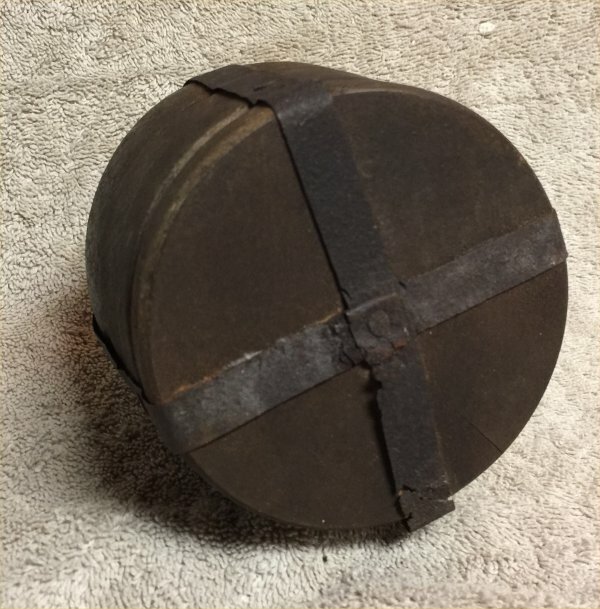 Of interest there is an old stencil of "12 Pdr" on the sabot that appears old but I'm not sure of that. It can be seen in the 2nd image. 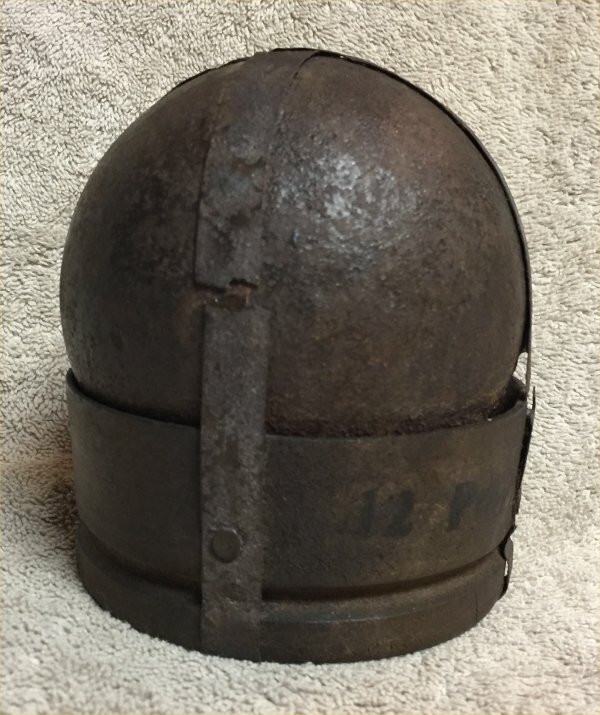 At one time someone put a light coat of polyurethane over the shell and sabot to protect it. 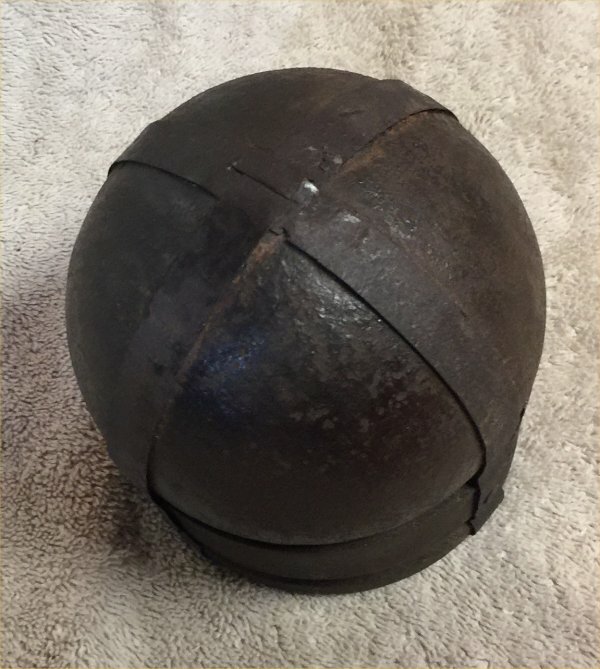 A very uncommon chance to own a non-battlefield cannon ball still on the sabot.